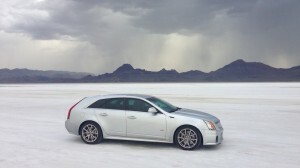 What do you know about the Bonneville Salt Flats? If you’re like me, you probably think it’s an empty, salty place where crazy people drive rocket-powered vehicles at speeds normally reserved for passenger jets. Or maybe you know of it from that Anthony Hopkins movie. You know the one: he travels all the way from New Zealand with his rickety old motorcycle only to discover they don’t have his paperwork, and he’s only allowed to race in a rented Ford Escape. Well, I’ve recently learned something else about the Bonneville Salt Flats: they’re a lot of fun. Before we get to that, a little background. As you know, I’m taking my CTS-V Wagon on a long roadtrip from Atlanta to California and back with my girlfriend. We’re now in the “and back” stretch, meaning we hit Monterey Car Week, Yosemite National Park, the emptiness that is Nevada (State motto: Watch for cattle on roads!). You’d know all this if you followed me on Twitter, which I highly suggest because I sometimes take some cool pictures of the V Wagon in front of stuff. Anyway: while the quickest route back from California would’ve been through the southern half of the country, I wanted to return via Colorado to see family. That meant driving through Utah, a state of immense natural beauty and something like five different national parks dedicated to bizarre rock formations. Well, we skipped all of that. 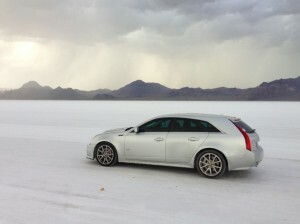 Instead, we went to the Bonneville Salt Flats. 1. There’s a lot of salt. Anyway: we arrived at the flats in the evening. For those who think it’s a place where you have to buy tickets, or stand in line, or hop fences, you’re wrong. That’s only during Speed Week. When no one is there, the road to the flats simply ends and there’s a soft grade down to the salt. Anyone can get on, at any time, in any vehicle. As we drove on to the flats, I had just one goal in mind: don’t crash. I wasn’t sure I wanted to do anything more than that for many reasons, like the fact that we still had to drive the car across the country; the fact that I’ve already driven at high speeds on the autobahn; and most importantly, the fact that the area is so desolate you get the feeling the local doctor is also the mayor, the sheriff, and the guy who runs the fillin’ station. So we set out on to the flats cautiously, driving at normal speeds and getting used to the terrain. But while I planned to go slowly, I was quickly egged on by the only other group on the flats: Cadillac. It seems Cadillac was there to test pre-production ELRs, which made me feel a little safer. After all, if General Motors engineers thought this was OK, how bad could it be? Within minutes of our arrival, the Cadillac crew departed the flats, likely done for the day. Even though they were about 40 feet from my car – and I was the only other person around for miles – they never even glanced at me. Ahh, Cadillac pride. With the Cadillac crew gone, we made our way a few hundred feet to the “track” that was marked with cones. Speed Week was just a few days ago, which meant the salt was perfectly smoothed and the lanes were easily discernible. So I lined up at the first cone, pushed the accelerator to the floor and … spun my tires. 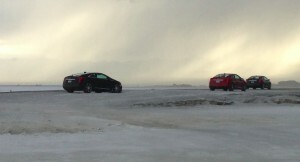 It turns out driving on the salt is best done from a gentle roll, or else you’ll have trouble getting traction. So I lined up again, pushed the accelerator lightly, and began my first run. 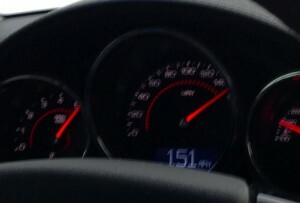 Egged on by my girlfriend, I reached 130 miles per hour … while driving on salt. With no one around and a little daylight left, I decided to try again… then again. The flats have this effect. You think “I can do a little better!” and the next thing you know, you’ve been out there six hours and there’s enough salt on your car to de-ice metro Detroit for an entire winter. After departing the flats, we drove back to nearby West Wendover, Nevada, a town that has roughly the same number of casinos as residents. While the rain took most of the salt off the Wagon, we gave it a thorough car wash – including a heavy underbody spray – and went to dinner. Climbing into bed that night, the adrenalin was still pumping from hitting 151 miles per hour – as legally as possible – in the United States. It may seem like you’re just driving in a straight line, but Bonneville is a lot of fun. You don’t even need a CTS-V Wagon to enjoy it. All you need is a smooth stretch of salt, a sense of adventure, and a nearby car wash. This story was originally posted on Jalopnik. Great write up. Man, I wanna go there. How long did it take to get up to 151? I’ve been following your trip since I saw it posted on Jalopnik… really epic drive. Being someone who’s done similar trips across the US in a performance vehicle (9,281 miles in 2011 and 11,146 miles in 2012), yours brought back lots of great memories. I wish I hadn’t been out of town when you drove through my area. Of all the places I visited Bonneville has definitely become one of my all time favorites. Yes, the National Parks in Utah are beautiful, but for an automotive aficionado the Salt Flats at Bonneville is someplace you have to visit at least once in your life.